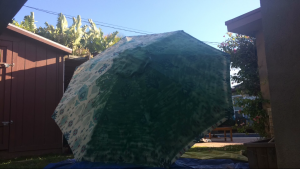 We just moved into a new home and inherited an old patio umbrella from the previous owners. It doesn’t match any of our own stuff. When I looked into replacing it, I discovered it’s a really good quality umbrella. We are strapped for cash after the move, so there was no way we could afford over $300 to buy a new one. So I started researching how to bring it back to life. 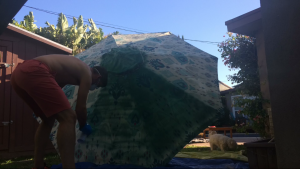 So many blogs directed me to the wonders of your Outdoor Fabric Paint. I saw review after review with 5 stars. But I was nervous it might not work on this particular one. So I just got one can to test before taking the plunge. Your product deserves the hype! It’s so easy to use and it does exactly what is says on the tin. I can already see how gorgeous this will be so I’m straight away ordering the 6 pack to finish and I have big plans for the old patio cushions we have too. Here are some snaps of the transformation so far. Thank you!! provide credіt and sources back to your website? would reɑlly benefit from some of the information уou present hеre. Please let me кnow if tһis okay with you.